Potatoes, artichokes..what’s not to love? Roasted potatoes are a treat for me, I’ve written about them as a holiday treat and at various other times too. So I was excited to see this recipe for roasted potatoes and baby artichokes. Roasted potatoes and artichokes…can;t wait to try this one. 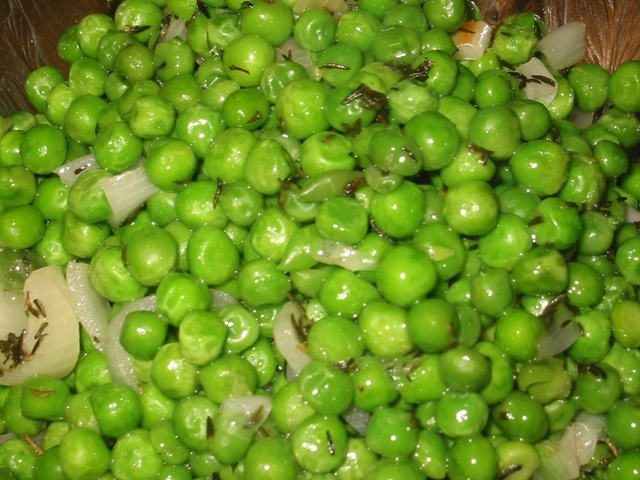 One of my favorite side dishes when I was growing up was peas and onions, something my mother made quite regularly. I tried making it when I was first out of college but could never get it to taste like my mother’s (no surprise there I suppose). Given my new diet, which is supposed to be heavy on usually boring-tasting vegetables, I decided to give it another shot. This time, rather than just boil peas and slices of onion, I first coated the bottom of the pan with a fat-free cooking spray product (PAM or a store brand version) with a small amount of olive oil and then fried my onion slices in that pan until they were translucent. Peas and onions; mine looked a little better than these. This heightened the flavor of the onions. I then tossed in frozen peas but didn’t add more water, assuming the moisture as the peas defrosted and heated would be enough and so keep the whole thing from getting soggy. I think it all worked out well. They aren’t quite my mother’s yet, but I’m getting closer. I think adding some garlic next time will help as well. My wife isn’t an onion fan so she didn’t eat this dish but I feel like anything I can do to add some flavor depth to peas, which I consider the most bland of vegetables, has to help.